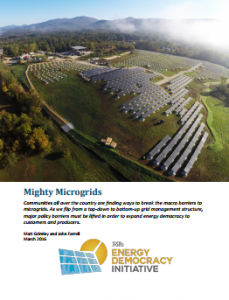 The Institute for Local Self Reliance (ILSR) has released a report, Mighty Microgrids, with recommendations for unlocking the benefits community microgrids. Though the report labels microgrids as unstoppable, it lists several key barriers keeping ratepayers from seeing the benefits such as lower rates, cleaner energy, and a more resilient communities. Realizing the full benefits could require a fundamental shift in the way electric markets are designed and operated, a realization that California and New York are grappling with. ILSR characterizes the needed change as a shift from top-down to bottom-up grid management structure, which will require some major policy changes. Since 1974, ILSR has worked with citizens, activists, policy-makers, and entrepreneurs to promote policies that maximize community resources. The democratization of the electric grid has been a key area of their work since the beginning, with a focus on delivering the economic benefits of renewable energy to communities through widespread participation and ownership. They see microgrids as a unique and valuable tool for customers and communities to control their energy quality and costs. As renewable energy and storage costs decline, there is strong potential for growth. However, . A microgrid is undefined in most states – It is often illegal for any entity except a monopoly electric utility to sell or distribute electricity. Companies who offer solar leases, such as SolarCity face a similar challenge, but 26 states modified their laws to unlock the market. Defining a microgrid could allow microgrid hosts to operate without being labeled and regulated as an electric utility. Only the monopoly electric utility is allowed to provide an electric connection between buildings that cross public roads – Electric utilities have been given this monopoly to avoid having redundant distribution lines by different companies. It benefits the ratepayer to give one company this monopoly, but it means microgrid host often cannot connect buildings together. Since the community microgrid would benefit the ratepayers while providing resilience, there needs to be an exception. Interconnection Rules – Both the microgrid and utility grid benefit from being connected, but many states lag behind IEEE’s standards, and allow electric utilities to require burdensome studies and limit microgrid interconnections without transparency. Who pays for it, and who benefits from it? – Nearly all microgrids to date have been behind the meter, with a clear financial or resilience benefit for the entity that put up the money. However, the best opportunities for microgrids have multiple beneficiaries. For example, Clean Coalition has shown strategically placed resources such as solar PV and battery banks can defer investments in transmission infrastructure. At the same time, the DERs benefit the community by providing enough local generation to power critical infrastructure in the event of a grid failure. The market mechanisms to allow the different beneficiaries to share the cost and ownership do not exist yet, said Craig Lewis of Clean Coalition on a ILSR podcast. In addition to those barriers, when incumbent utilities loose sources of revenue, it can get ugly. The report cites a $125 million charge due to three Las Vegas casinos who recently sought to disconnect from NV Energy to compensate for lost revenue. Such fees obviously discourage clean energy consumption or self-supply. The report continually points to California, New York, and Connecticut as notable exceptions to some of the barriers. Significant microgrid activity has closely followed policy in these states, showing clear economic and environmental benefits to getting policy right. Community microgrids, located over distribution networks offer more than backup generation, can generate a large portion of the community power needs locally. When the utility grid is operating normally, those distributed resources are providing value to the entire community, which could be several thousand customers. In the event of a failure in the utility grid, the distributed resources able to maintain power for critical resources that benefit the entire community, such as water treatment plants and community centers for emergencies. The paper encourages regulators and policy-makers to encourage a market structure that enables community energy choices, without preference for centralized generation and rate-based transmission.